Is Forest City Realty Trust, Inc (NYSE:FCEA) A Good Stock To Buy? Does Forest City Realty Trust, Inc (NYSE:FCEA) represent a good buying opportunity at the moment? Let’s briefly check the hedge fund interest towards the company. Hedge fund firms constantly search out bright intellectuals and highly-experienced employees and throw away millions of dollars on research activities, so it is no wonder why they tend to generate millions in profits each year. It is also true that some hedge fund players fail unconceivably on some occasions, but their stock picks have been generating superior risk-adjusted returns on average over the years. Is Forest City Realty Trust, Inc (NYSE:FCEA) an exceptional investment right now? Money managers are selling. The number of bullish hedge fund bets dropped by 9 lately, and there were 34 smart money investors with long positions in the company at the end of the third quarter. This number of bullish investors was not enough for the company to regarded as one of the 30 most popular stocks among hedge funds in Q3 of 2018. Even though the company has experienced a decrease in the number of shareholders and wasn’t one of the favorite stocks during the third quarter, we still think it should be further researched and analyzed. To the average investor there are several formulas shareholders can use to value stocks. Two of the most under-the-radar formulas are hedge fund and insider trading signals. Our researchers have shown that, historically, those who follow the top picks of the elite fund managers can outperform the S&P 500 by a superb margin (see the details here). We’re going to view the latest hedge fund action encompassing Forest City Realty Trust, Inc (NYSE:FCEA). How have hedgies been trading Forest City Realty Trust, Inc (NYSE:FCEA)? At the end of the third quarter, a total of 34 of the hedge funds tracked by Insider Monkey were long this stock, a drop of 21% from the second quarter of 2018. 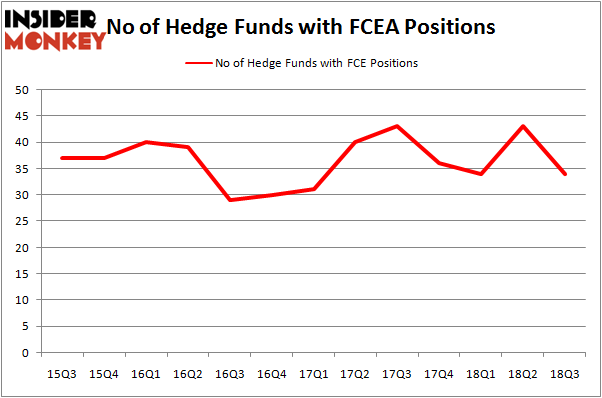 The graph below displays the number of hedge funds with bullish position in FCE over the last 13 quarters. With hedgies’ capital changing hands, there exists a select group of noteworthy hedge fund managers who were boosting their holdings meaningfully (or already accumulated large positions). The largest stake in Forest City Realty Trust, Inc (NYSE:FCEA) was held by Scopia Capital, which reported holding $543.8 million worth of stock at the end of September. It was followed by Starboard Value LP with a $383.2 million position. Other investors bullish on the company included Millennium Management, Alpine Associates, and Water Island Capital. Since Forest City Realty Trust, Inc (NYSE:FCEA) has experienced falling interest from the aggregate hedge fund industry, we can see that there was a specific group of money managers who were dropping their full holdings in the third quarter. Intriguingly, Mason Hawkins’s Southeastern Asset Management said goodbye to the biggest investment of the 700 funds watched by Insider Monkey, valued at about $190.4 million in stock. Clifton S. Robbins’s fund, Blue Harbour Group, also said goodbye to its stock, about $122.3 million worth. These transactions are important to note, as total hedge fund interest was cut by 9 funds in the third quarter. 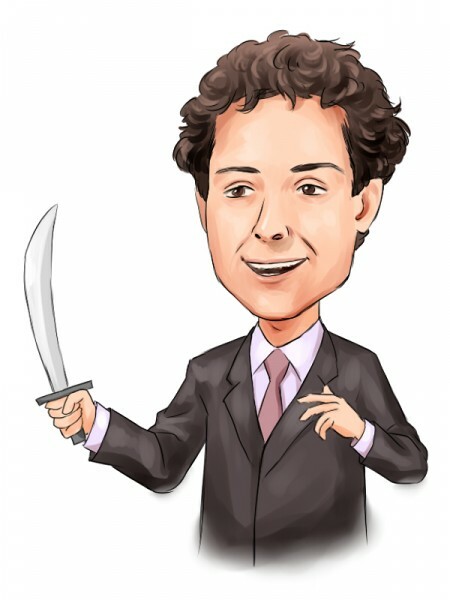 Let’s now review hedge fund activity in other stocks – not necessarily in the same industry as Forest City Realty Trust, Inc (NYSE:FCEA) but similarly valued. We will take a look at Allison Transmission Holdings Inc (NYSE:ALSN), The Stars Group Inc. (NASDAQ:TSG), Old Republic International Corporation (NYSE:ORI), and Assurant, Inc. (NYSE:AIZ). This group of stocks’ market values are closest to FCE’s market value. As you can see these stocks had an average of 30 hedge funds with bullish positions and the average amount invested in these stocks was $790 million. That figure was $1.78 billion in FCEA’s case. The Stars Group Inc. (NASDAQ:TSG) is the most popular stock in this table. On the other hand Old Republic International Corporation (NYSE:ORI) is the least popular one with only 20 bullish hedge fund positions. Forest City Realty Trust, Inc (NYSE:FCEA) is not the most popular stock in this group but hedge fund interest is still above average. This is a slightly positive signal but we’d rather spend our time researching stocks that hedge funds are piling on. In this regard TSG might be a better candidate to consider a long position.